Given the huge discography afforded Mozart's piano concertos, a new recording has to be rather special to gain any leverage on the market. Sad to say, this new Somm recording is neither special nor as rewarding as the comparison versions listed above. However, it does possess some fine features that should be noted. Formed in 1996, the Orchestra of the Swan tends to specialize in new music and has commissioned numerous works in recent years. 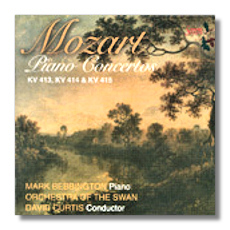 This is a fine orchestra that executes the Mozart piano concertos in excellent fashion. Pianist Mark Bebbington, who has garnered much praise for his recordings of British piano music, gives a sterling performance that is fluid and graceful while partnering expertly in dialogue with the orchestra. The problem with the performances rests with the orchestra's director, David Curtis. He might well be outstanding in conducting modern music, but his way with Mozart is problematic. To come to the crux of the matter, I need to provide some background to the three concertos on the disc. Mozart wrote them soon after his departure from Salzburg and arrival in Vienna. His aim was to gain a fine reputation in Vienna and earn considerable monies. As Mozart wrote to his father in the autumn of 1782, "These concertos are a happy medium between what is too easy and what is too difficult; they are very brilliant, pleasing to the ear, and natural, without being vapid". I would add that these three concertos, unlike a few of his more mature works in the medium, are relatively devoid of any profound utterances – brilliance, vitality and lyricism are the qualities that need to be highlighted. However, Curtis employs slower tempos than those from the comparison performances, thereby dampening the music's brilliance and vitality. I have nothing against slower than normal pacing as long as there are benefits to be gained, but no benefits are forthcoming from Curtis. Instead, the performances come through as somewhat lumbering vehicles that fail to take flight. Of greater damage is the soundstage listeners have to endure. The upper strings are on the grainy side, bass response is boomy/poorly defined and the piano tone is too wet and overly reverberant. The absence of a bloom to the sound is a major detriment to a Mozart recording, and Curtis and his forces are not able to overcome this problem. Don's Conclusions: Given the slow tempos employed by Curtis and the rather odd and unattractive sonic properties, I am unable to put my stamp of approval on this new Somm recording. The comparison versions are just the ones I listened to in conjunction with this review. There are also many other alternative recordings of these three piano concertos that surpass the Somm. One choice that comes to mind is the recent Arte Nova cycle featuring pianist Matthias Kirschnereit and the Bamberg Symphony Orchestra conducted by Frank Beermann; it contains youthful and vibrant accounts of Mozart's earlier piano concertos that significantly best the heavy performances from Curtis and his orchestra. In any event, readers are advised to "take a pass" on the Somm; the competition is overwhelming.